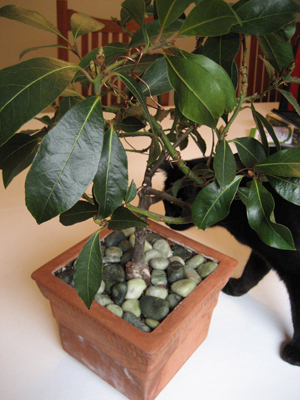 Do you have a little stinker of a cat like our Crow who can’t leave the potting soil in house plants alone? Some cats even use plant pots as a litter box. At least Crow doesn’t do that! I found a quick fix to keep cats out of plant pots—just put down a layer of decorative rocks. Beach glass would work too. Use something that’s too big to be attractive to dig in and isn’t round enough that it looks like a toy. 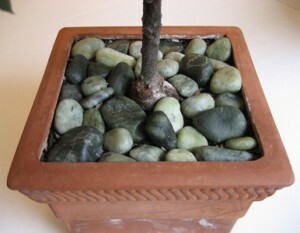 The roots of the plants can still breathe and you can just lift a rock to check if the soil is dry and needs water. cover in a layer of rocks!